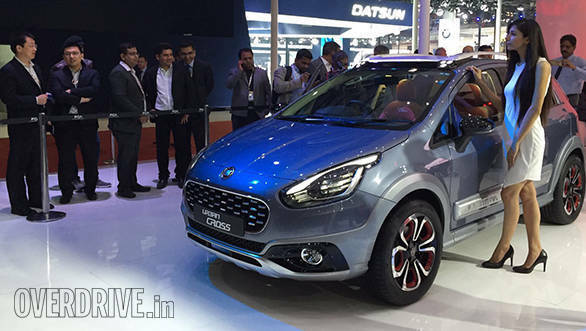 Fiat India has showcased the Avventura Urban Cross, which will be officially launched in the third quarter of 2016. As the name suggests, the Avventura Urban Cross is essentially an updated version of the regular Avventura, and also comes equipped with new roof rails and body cladding. The biggest difference between the two however, is that the Avventura Urban Cross doesn't have the spare wheel mounted to the rear end of the car. The Fiat Urban cross comes with a dual tone interior, new 17-inch alloys, turn indicators on the ORVMs, LED tail lamps and follow-me-home headlamps. Additionally, it gets a touchscreen infotainment system with Bluetooth and Aux compatibility and navigation. The Avventura Urban Cross is powered by the same 1.4-litre T-Jet petrol engine seen in the Avventura Powered by Abarth. This engine produces 140PS of maximum power and 210Nm of torque and is mated to a 5-speed manual gearbox. Speaking on the occasion, Kevin Flynn, president and managing director, Fiat Chrysler Automotive India said, "The new Urban Cross is ruggedly stylish, feature loaded and powerful with a world-class design and superb handling. It will be launched this year. Innovating and providing better quality sales and after-sales services remains our constant endeavour."